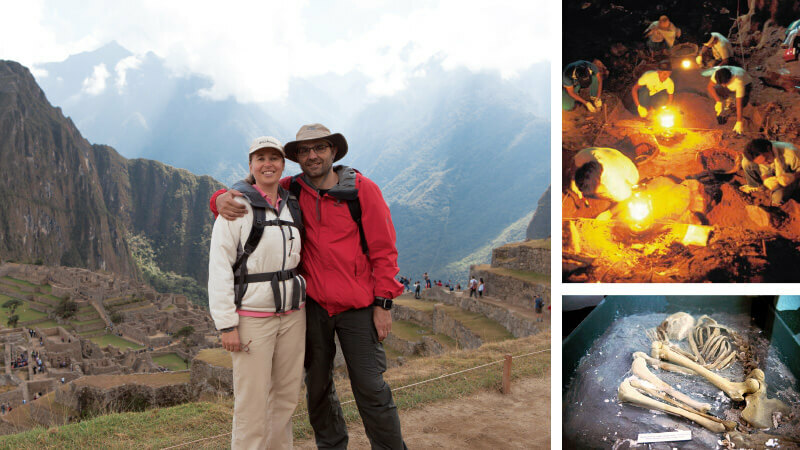 Ancient Origins (www.ancient-origins.net) started out as a hobby for Joanna Gillan and her husband Ioannis Syrigos because ancient history was their top passion. They started the website while continuing their day jobs, frequently adding articles to it and using social media, among others, to gain traction. They thought it would attract a few like-minded people (after all, how many people in the world are interested in ancient history?). But when it took off, it far exceed all expectations, going from a few hundred visitors to four million unique visitors a month, making it the top ancient history website in the world. Gillan spoke to Enterprise in a Skype interview recently about how the website was born, grew and expanded so rapidly, and where she and Syrigos plan to take it. Gillan has a very varied background. An Australian by birth, she did a psychology degree and spent eight years teaching children with autism. She moved to London for six months of travel, but ended up “accidentally getting a job with the Royal Family, so I ended up living there for five years”. She met her husband, who is Greek, in London. “We moved to Greece and it was there that we decided to start a project together. Both of us wrote a list of 10 things that we were interested in and ancient history was at the top of our lists. And that is as simple as it gets. We decided, ‘That’s it. Let’s do an ancient history website.’ That was how it all began,” says Gillan. Syrigos’ background was in artificial intelligence, web development and web management. “So, he had the skills to put together a website,” she says. Ancient Origins started as a personal hobby. “We both had our day jobs. He was working on his computer career and I was working on mine. We just wanted this for our own interest because we really love ancient history,” says Gillan. That was because the articles on the website were neither academic nor boring. “It was about fun stuff like weird artefacts and lost cities that you do not often hear about. We wanted to make history come alive for people,” she says. The couple started Ancient Origins in 2013 and spent the first two years writing articles and making the content available to people. But the rate at which the website caught on took them by surprise. “It became very popular so we started to put more and more time into it. And it started to grow and grow. In the end, we both had to quit our day jobs to put 100% of our time into Ancient Origins,” says Gillan. At the beginning, only she was writing the articles that appeared on the site. But as time went on and the site became more popular, it started to attract the attention of archaeologists, historians and researchers who wanted to contribute as well. “I suppose they wanted to promote their theories and their work. We were happy to share their work because we have an open door approach to ancient history. We do not have an agenda that says, ‘This is allowed’ and ‘This is not allowed’. It is very much, ‘Let’s hear everyone’s perspective on history’,” says Gillan. Naturally, there were some people they actively sought to write articles for the website. “For instance, Graham Hancock. He is a big name in the more alternative history field. We like to have both mainstream history and more alternative perspectives. And Hancock is probably the number one historian known for presenting a different side to history,” she says. After two years of writing and compiling articles, the couple knew that they wanted to really get into this field, and not just from an academic perspective. “We wanted to see the ancient sites and talk to the indigenous people, hear about their mythology and learn more about their history directly from the source,” says Gillan. If adventure was what they were looking for, they got it with a vengeance. On their first trip to Ecuador, Syrigos was kidnapped, or rather “arrested for trespassing”, by an indigenous tribe and put on trial. It happened like this. They had decided to start by exploring the Tayos caves, which is one of the most ancient sites in Ecuador. They chose this as their first port of call because some 30 years ago, there had been a huge expedition to these caves by a team comprising Ecuadorian and British military, not to mention archaeologists, historians and more than 100 scientists and researchers. Even the astronaut Neil Armstrong was involved. “It makes you wonder why such a huge expedition and what they were looking for. It is still a bit of a mystery. All that came out of the expedition was that they had found a few artefacts — and that was it. Nothing else was mentioned, no real rationale explaining why they had gone into this cave system and what they were really looking for. This got my husband interested and he said he wanted to go there and see the cave system for himself,” says Gillan. There was one small detail, however. The cave system was in the territory of the Shuar, an indigenous people who still lived in the traditional way and were not subject to the laws of the rest of the country. Although some of the Shuar were friendly, others were appreciably less so. Syrigos made contact with the locals and said he really wanted to go into the caves. He asked how he could get permission from the Shuar to enter their territory. “A lady said she could give him a guide to take him to the community and the guide turned out to be a six-year-old boy who led them for hours through the jungle to a community of friendly Shuar,” says Gillan. Syrigos was walking in the jungle with a colleague when the two of them were suddenly surrounded by a group of armed men. They could barely communicate because this tribe spoke their own language while all Syrigos and his colleague had was broken Spanish. They were taken back to the village and put on trial. In Ecuador, the indigenous people operate by their own laws. “If they decide you are guilty, they are allowed to do whatever they feel is appropriate. So, this was a little bit of a risky situation. They put them on trial in a village of 100 to 150 villagers and my husband and colleague had to explain what they were doing in this territory,” says Gillan. By this time, it was midnight and pitch dark. Syrigos had no idea where he was or how he was supposed to get back to where he had come from. To make matters worse, there was apparently another tribe, who were head hunters, even further on. So, a website on ancient history is not all dusty academic articles and artefacts. In fact, it can be controversial because the information is often political and sensitive, says Gillan. There is a lot of pushback (to the point of threats on life) to any information that is not in accord with the accepted narrative. “There are clashes between cultures that can stir up anger. We find that a lot with our site, even though we always report from a very neutral perspective. We are only reporting on history, but there are inevitably people who get angry because they do not like certain histories being told,” she says. This led to another investigation in Ecuador that also got Ancient Origins in trouble. “We were investigating Father Carlos Crespi Croci, who was an Italian missionary who went to Ecuador in the 1930s and stayed there for 60 years. He did a lot of good work there and in return, the indigenous people started bringing him artefacts from all around the country that were anything from 200 to 2,000 years old, covering all cultures and ages — a really amazing collection,” says Gillan. But in this collection was a subset of very controversial artefacts that depicted Sumerian writing, gods and figurines. “If authentic, this would mean that there was contact between Sumeria, in what is now Iraq, and South America. And there is nothing in the history books about contact between the continents thousands of years ago,” she says. The two founders of Ancient Origins then received emails from parties within Ecuador, threatening legal action if they decide to write an article. “They said they would sue us and all kinds of things to stop us from looking into those missing artefacts,” says Gillan. But surely it would be better to know what really happened than to believe something false? “That is what we think. It is better to know. It is better to tell history as it is. But there are some very conservative archaeologists who like to keep things as they are. They do not like to rock the boat or change currently established theories to something that sounds very radical,” she says. While all of this is fascinating, how have the couple managed to fund their passion? “The first four years, the only income was from advertisements on the website. But because the website gets good traffic, it means that a single ad can bring in a reasonable amount of money,” says Gillan. She acknowledges that no one likes ads on a website, but when you are offering free content, there is always a balance that needs to be struck for the website to earn money through other means. As the website expanded, however, its financial commitments grew. “We needed to hire more people. So, we offered a subscription service where we have a premium website. Whoever subscribes gets extra articles, more e-books, webinars, interviews, giveaways and all those added benefits. That became a second income stream,” she says. Ancient Origins has a much bigger team now. “They are all freelance contractors living all around the world. So, we actually cover 12 countries. We have people working for us in Canada, the US, India, Ecuador, Sweden, Italy… many countries and this is what we love. It is a very international team and we have Skype meetings all the time. We also have a system to communicate through the website,” says Gillan. 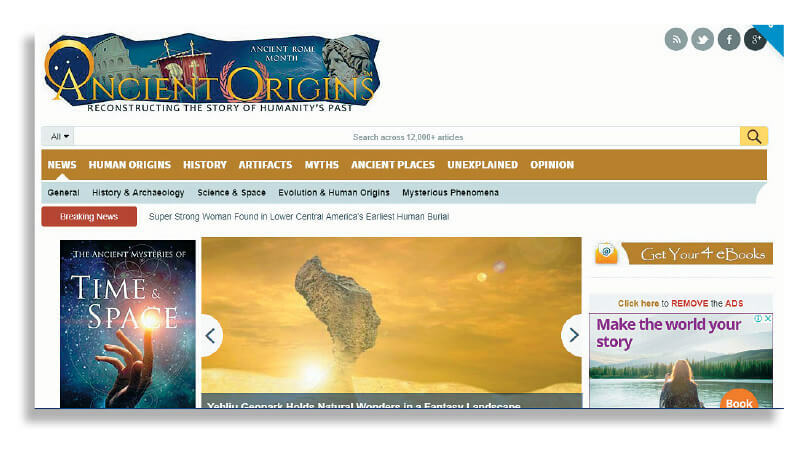 Ancient Origins has about 30 people on its team, as well as 240 contributing writers and guest authors, providing content to the website. From a few hundred visitors when it started in 2013, the website now receives four million unique visits each month. Visitors from the US make up about 58% of its audience. “In the top five, we also have Canada, the UK, India and the Philippines,” she says. Gillan and Syrigos have big plans for Ancient Origins. “Our plan is to get much more in the field. Until now, we have been really focusing on getting a lot of content out there. But now, we want to do some of our own investigations to bring new discoveries into the mix, to find things out for ourselves and involve our readers in that,” she says. This is why they have introduced expeditions to various ancient sites as part of the website’s offerings. “And we are going to start tours to different ancient sites around the world. Our next expedition is to Columbia in South America in February,” says Gillan. There are currently about 13,000 articles on the website. “We take a collection of those that have a theme and we extend the articles, go more in-depth into them and compile an ebook. So, we are making use of content that we already have, but we are expanding on that and putting it together in an easy-to-read format,” she says. The founders of Ancient Origins are very interested in Malaysia, as well as the rest of Southeast Asia, as recent archaeological findings in this part of the world has put it on the map of ancient history. In the early 2000s, evidence was found of a paleolithic site in Bukit Bunuh (in Lenggong, Perak) that functioned as a workshop for making stone tools some 1.83 million years ago. In 2009, archaeologists discovered hand axes, regarded as the oldest stone tool in the world, on the site. According to the Unesco website, these hand axes are the oldest discovered outside Africa. “Undisturbed in situ Paleolithic stone tool workshops are located on the shores of a paleolake and ancient river gravel beds and dated in a long chronological sequence. A meteorite strike 1.83 million years ago blocked and diverted the river preserving Palaeolithic tools at Bukit Bunuh, where hand axes are among the oldest so far discovered outside Africa. Analysis suggests these were made by hominids, which thus provide an extremely early date for hominid presence in Southeast Asia,” says the Unesco website. “These kinds of findings should be front page news around the world because they change the whole narrative that all humans originated in Africa and spread out to the rest of the world,” says Ancient Origins co-founder Joanna Gillan. So, Gillan and her husband Iaonnis Syrigos will be organising expeditions to these countries to put a spotlight on the archaeological discoveries there in Ancient Origins, which has been ranked the No 1 ancient history website in the world. “It definitely needs a lot more exposure and what we are doing at the moment is trying to go through country by country and put a spotlight on each country. We need to really focus on each country, one at a time, to try and cover all the major finds in that country,” she says.